They were custom made by an external burning chosen by the bride and groom. Each ring is embellished with an internal engraving with a quote of their choice. This custom order consists of an external etching with the symbolism of infinity. We find the number Pi ended with a point series, evoking the continuity and eternity. It is also on this ring symbolizes the infinite. The set reflects the infinite and eternal love that is committed for this couple. The interior alliances was etched with their names and symbols specific to their meeting and their love story. It is artisan etched. The etching process takes times but the result allows appreciating the intricate and delicate patterns. The bas relief effect is really nice. The deeper part is matte and the upper part has been sanded and polished. Shiny finish. The bands are 4 mm large. 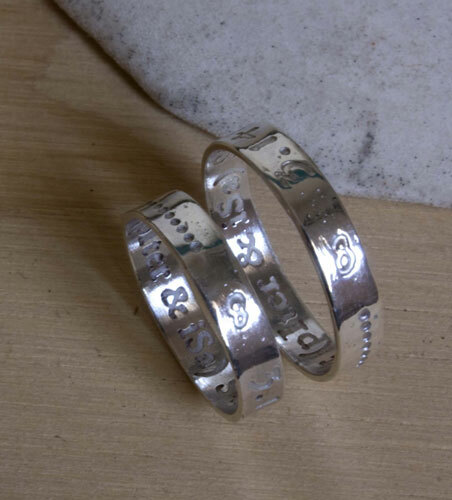 Tag: ring, sterling silver, alliance, personalized, customized, wedding, engagement, promise, unique, gift, valentine, mother’s day, birthday, custom order, relief, infinite, love, couple, eternity, pi, symbol, symbolism, meeting.